In 1858, the stench of human, animal and industrial waste emitting from the Thames grew unbearable for politicians located in the new riverside Houses of Parliament. There had been valid concerns for many years that this odour was associated with death and disease. Therefore it was agreed that urgent action must be taken to rid London of this ‘Great Stink’. Citizens in London had been plagued by the unsanitary conditions of the Thames for decades. The population had more than doubled since 1800 and stood at around 3 million people in 1850. Waste was washed into the Thames, but the river simply couldn’t cope with the amount of excrement flowing within it. During high tides, sewage would spill back into the streets. The invention of flushing toilets which was debuted at the Great Exhibition in 1851, exacerbated the problem further as cesspools became completely overwhelmed. As disgusting as the piles of excrement lying in the street were, the real problem came from the effects of drinking this contaminated water from the River Thames. Water-borne diseases such as dysentery, typhoid and cholera claimed the lives of more than 30,000 Londoners between the years of 1831 and 1854. The emergency sanitation situation led to the formation of the Metropolitan Board of Works. This organisation was given the authority to raise £3 million and begin work immediately. The board appointed chief engineer Joseph Bazalgette, who had already spent several years proposing ambitious plans to improve sanitation in London. Once Bazalgette received the green light to start work, construction of his elaborate Victorian sewage system began. It was made up of 82 miles of new underground sewage tunnels that formed a network running parallel to the river. These tunnels were on a slight gradient so used gravity to drain the sewage from the city. Smaller tunnels were egg-shaped in design, being narrower at the bottom than the top which also encouraged the flow. Surface water and waste were intercepted along the route and flowed to outfalls at Barking on the north side and Crossness on the south side of the Thames. From these points it flowed more easily out to sea. In addition, extravagant pumping stations which resembled cathedrals were built at Chelsea, Deptford, Abbey Mills and Crossness. These raised up sewage from low-lying areas to be pumped onwards to the outfalls. Many of London’s rivers, including the River Fleet, were integrated into the drainage network, taking the rivers underground and out of sight. Bazalgette’s design was hugely successful and almost immediately halted further outbreaks of cholera in the capital. His sanitation system was absolutely revolutionary and inspired many other urban settlements to build their own sewage networks. Bazalgette went on to train young engineers and provide guidance to British towns and cities about their own sanitation systems. Further afield he even offered counsel to town planners in Budapest and Port Louis in Mauritius. Bazalgette had the foresight to plan for a population increase when building his sewage system. His plans accommodated a population growth of 50% so that it could cope with the waste of 4.5 million people. However, within 30 years of the project being completed, Londoners had grown to a mass of 6 million. Now in 2016, Bazalgette’s great feat of engineering is constantly tested by climate changes and much-needed repairs due to the increased population. 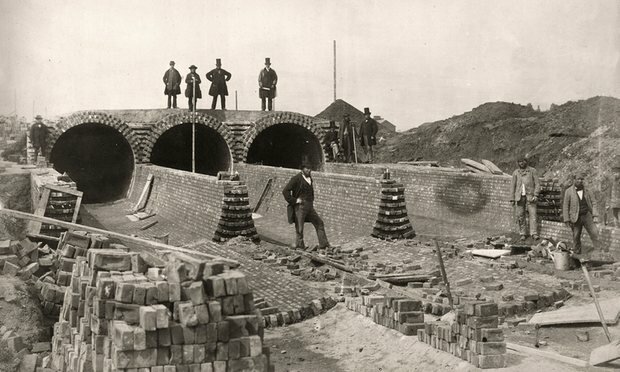 Whilst many parts of the network are upgraded and new projects plan to improve the conditions, the spine of London’s sewage system is built on the work of one great man – Joseph Bazalgette. The 8.6 million Londoners currently residing in the capital should all be thankful to him for the sanitary city that they live in. Fraser Ruthven is the Marketing Associate for London Drainage Facilities, one of London’s leading drainage companies. London Drainage provides a wide range of drainage diagnostic and repair services in and around London.